Bead blast one set and do a black oxide treatment on the other and it will be much more permanent, and probably look nicer than paint. I like this… Great idea for a car enthusiast… If you wanted to show off the underneath, some black and white flake in clear laquer could work but i like the simplicity of paint in this case myself ???? Looks simple enough to make yet neat present for a mechanical person. its good to see people making use of & adding diversity. The knight look a bit short but I love it anyway. Ingenious, exploitative and artistic all at the same time. Also, bishops and knights are the wrong way around. I came here to say just this, doubted my memory of placement for a second. The board HAS to be made from a checkered flat! Very innovative idea and nice execution! I guess I’ll have to be “that guy” and point out that he’s got the knights and bishops sitting on the wrong squares? Innovative idea and nice execution! I guess I’ll be “that guy” and point out that the knights and bishops are on the wrong squares? Nice to see people still play chess. 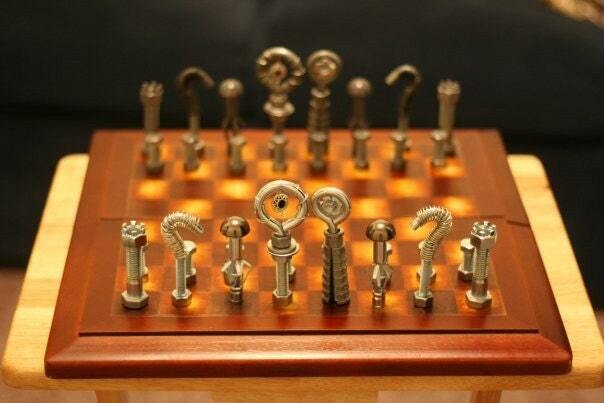 You can make chess from practically anything. No BBcode, only HTML. But for most images you can simply paste the URL and WordPress embeds it automatically, as long as it ends in .jpg or .gif. Some image sites don’t work, Imgur gets messed up. Just be courteous and don’t upload anything absolutely gigantic. How about Vacuum Tube Chess? Haha, sweet. You could do Russian tubes versus American tubes instead of colors. Instead of using money to buy the parts, just build the part with money!